Unless you have your own Pug, keeping the front-side of any monitor clean has never been a very easy task. Dusting the back side of an old CRT monitor, however, can be a real tedious nightmare. Here is one way to help you keep up with this task. No Pug required. Only a Grasshopper. Images via (our own) Flickr and Nikon Coolpix 8800. The Shodan test in Aikido is an opportunity for the Sensei of the dojo and the Aikidoka taking the test to evaluate their work and progress by receiving feedback from a senior Sensei of Dan 6 and above. Translated as "the Way of unifying (with) life energy" or "the Way of harmonious spirit" Aikido (合気道) is a Japanese martial art developed by Morihei Ueshiba in order to create an art that practitioners could use to defend themselves while also protecting their attacker from injury (Wikipedia). We love this attitude! 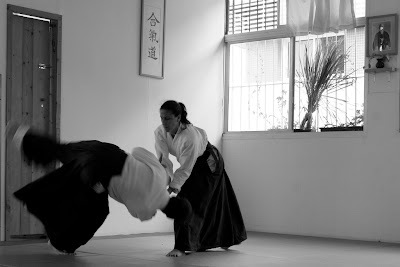 The following photo-set by Assaf Kessler highlights a few spectacular moments from an Aikido 1st Dan black belt Shodan test, preformed by aikidoka lady Tamar Katzav in Center Aikido dojo in Israel. For more images see Kessler's Flickr pages. 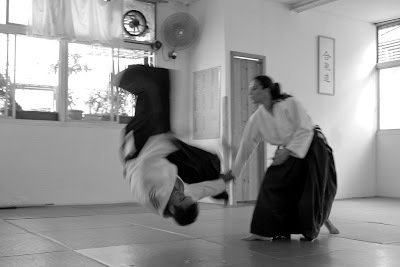 For some Aikido in motion, check on this short rythmic video from Center Aikido, a non profit organization dedicated to "furthering" Aikido in Israel. Since the tender age of fourteen, Kate Moss has been one of the most sought after supermodels, gracing magazine covers and catwalks the world over. Now, she seems to have made the transformation to the primary artist's muse of our young century. Judge for yourself if she can take her place in the pantheon of immoral muses. Is Moss the Muse or is it all a big "Muse-take"? This has taken many people by surprise, even though Quinn has produced a life size statue of Moss, "Sphinx" before. However, none of the, have been solid gold. Weighing in at a whopping fifty kilos, many believe this to be the largest gold statue created since the time of the Pharaohs. King Tut would no doubt have had the artist executed had it appeared in the way back when. Following in the tradition of Hurst's "For the Love of God" which was a skull encrusted with fabulously expensive diamonds, is this an 18 carat gold muse or a monstrosity? Supposedly hollow, this has become one of the current jokes about modern art, the artist and the model. 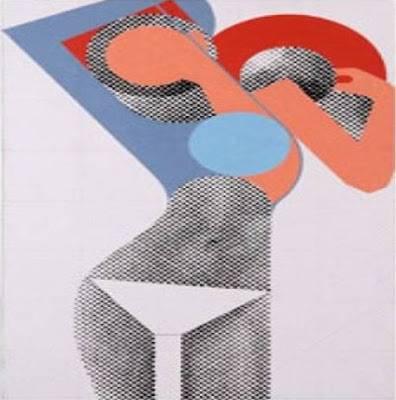 Laing became famous in the sixties for his pop art versions of stars such as Brigit Bardot. In 2006 he returned to this theme with a series of female icons of our own time. Kate Moss was one, along with Victoria Beckham and Amy Winehouse. The Moss picture is by far the most abstract. It is simply a woman in a bikini - there is a flesh colored circle which is her head. It is reminiscent in many ways of his work of Brigit Bardot in the sixties but also has a touch of Les Demoiselles d'Avignon by Picasso. Urban Art is making steady steps towards the mainstream. Banksy's screen-print of the model was sold at auction in February 2008 for ninety six thousand pounds. This was over three times the estimate and many more times the rating the print was given by some of the art world. Many have described it as derivative as it is a pastiche of "Marilyn Monroe" by Andy Warhol. Others see it as a cheeky take on both pop art and the nature of celebrity. It was Warhol, after all, who said that everyone was to have their fifteen minutes of fame. Moss, instead of Monroe, usurps the original painter and model, perhaps in a way that Warhol would enjoy! Many will say that Freud is the greatest living painter of the human body. Certainly, his works regularly reach dizzying sums at auction and this certainly reflects the respect that he has gained through his artistic life. 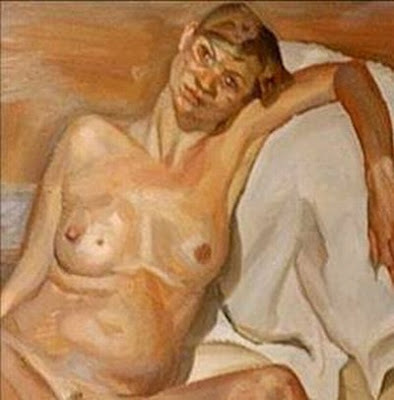 His portrait of Kate Moss, pregnant with her first child, is one of the few celebrity paintings that Freud has committed to canvas. 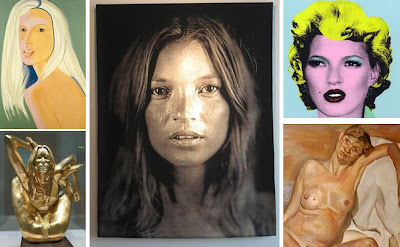 Pop culture and celebrity seem to go hand in hand, so it is a little odd to see Moss as a Freud model, so much is he connected with the postwar art period. This sold for over two million pounds in 2002. Bernhardt produced this for Japanese Vogue and however you judge it yourself, it has to be admitted that this is an unusual take on the famous (and sometimes infamous) model. She rifled through Moss' photographic back catalogue and came up with a series of images that certainly grab the attention. Moss is more like an oversized flower thrust on the canvas in a sensual, bold and provocative manner. It may not be your ‘cup of tea' but Bernhardt's images of Moss certainly created a storm. If you are "Murakami'd" then it means you are internationally well known and may well transcend what you were originally famous for. Certainly, Moss is much more than a supermodel and some might say much less. She has had the relationship with the rock star junkie, more than a few questionable relationships and a face and body that the camera loves - whether it is for a fashion show or snorting dubious white powder. This is not what it first looks like - yet another photo of La Moss. It is in fact a tapestry, which was woven in Belgium by the artist Chuck Close. The photo-realism of the tapestry is simply stunning. She does look a little, er, zitty, though! 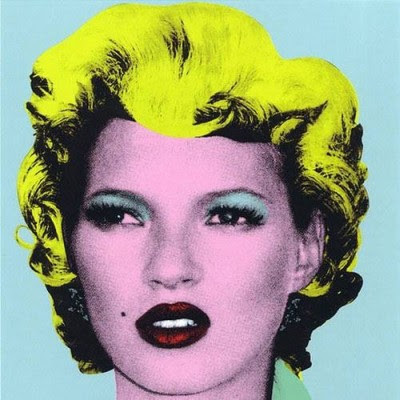 It is the artist's prerogative of course, but if one were to approach this portrait unaware of the model, who would possibly guess it was Kate Moss? Blond and bland, whatever could have been the artist's intentions? Back to an artist who at least makes her models appear something like they do in life, Vine takes the iconography of the model to a new level with written messages scrawled across the canvas. Some might find these messages inflammatory but the point is well made about the worship of celebrity in these times. Ms. Moss has even produced her own works of art which are gaining not inconsiderable prices in the art world. How much this is down to her celebrity or her talent is up to you. However, "Who Needs Blood When You've Got Lipstick?" may not be without artistic merit, in a Tracey Emin type of way. The work was completed in 2006 and is a self-portrait drawn, appropriately enough, in lipstick.